Retire in Oregon...Like your scenery with four seasons? Retire in Oregon will appeal to he same people who like Colorado and Montana. Out door types who enjoy the four seasons, don't mind the snow in the winter time, and can't wait for the first signs of spring. We are not exactly not biased having leased a spot for our RV in Oregon for the summer. We admit, if that described the writer, this would be written from Sunriver Oregon and not Arizona. Oregon is drop dead gorgeous, you are constantly surrounded by examples of the beauty of God's creation. We live in Arizona...sometimes it gets a little warm...when August rolls around we head for Sunriver...the fly fishing is first rate and we use blankets at night. Even in August it is not unusual to freeze a morning or two. I doubt you will ever run out of things to see and do in beautiful Oregon. In our RV we spent 4 memorable summers in Sunriver south of Bend in Central Oregon...we did this for three straight summers. We go back every year, and will be there this summer. Oregon will welcome you as well. If you retire in Oregon, you will enjoy it the most by getting outdoors and doing some hiking, the opportunities are endless. 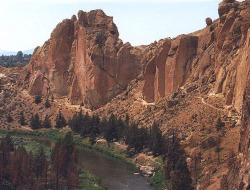 This is Smith Rock located north of Bend. The hiking trails follow the river and go up the rock as well. From the parking lot you walk down to the river, a drop of several hundred feet, and make your choice, river or up. It is a state park, $25 gives you a years worth of access here and other state parks...get one, it is a bargain. This a great place to RV cheaply as well as explore Park model living . We have first hand knowledge of both. Our friends mentioned in the park model link have a park model in Arizona, nice home in Oregon. We looked at park models in Oregon on our last trip and are considering doing the reverse. You will hear that Oregon is expensive...see for yourself. If you like variety, the RV is the way to go when you retire in Oregon. Here is a shot of the Oregon coast. 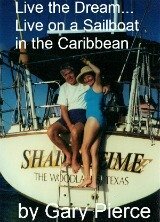 It is cool year round, 60's for a high is not uncommon in the summer, but for the beach lover it isn't a problem. 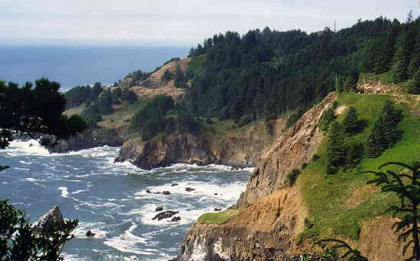 Driving 101 from Brookings in the south to Astoria in the north is every bit as beautiful as the California coast. If you haven't taken that trip, do so as soon as you can. When people think retire in Oregon they might be thinking Portland, Salem or Eugene. These cites are located about 100 miles inland from the Pacific on Interstate 5. The home of the Ducks (Eugene, OU) and the Beavers (OSU, Corvallis) they have all the vibrancy that comes with a university setting. If this is you...you will love it. Our experience in is in the Central Oregon area around Bend. if you have never been here, it's three to four hours drive from Portland, you owe it to yourselves to at least give it a look. Where we would be living now if we were not cold weather wimps. A city of 80,000 located at 3600 feet elevation. Bend is one of the prettiest towns you will ever see. It's what they call the high desert, gets 12 " of rain and 3 feet of snow a year. It has a Micro brewery and a Costco all the parks you can imagine, a gorgeous vibrant downtown area. If you need medical care you are going to be delighted at what you find in Bend. Attracted to Bend's quality if life, the doctors here are great. We have never encountered better anywhere. St Charles Medical Center is first rate, go have lunch in the cafeteria, cheap, good in a clean modern setting. One reader writes: "We came to Bend Oregon quite by accident, as we were trying to settle in the Ashland Oregon area, but could not find affordable housing or work there. My husband found a consulting job at St. Charles Medical which is the main hospital in Central Oregon, and he loved the open, caring and professional atmosphere there. He eventually got a full time job and we decided to relocate, and I've absolutely fallen in love with the area!" If you like outdoors recreation you will find it here. Bicycling is very big, hiking, camping, fly fishing are all popular. 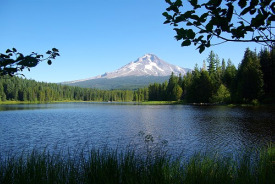 This is a picture of Mount Hood taken from one of the hundreds of lakes available for recreation if you retire in Oregon. You will find campers, fishermen, kayakers, families walking the dog, and photographers all in close proximity in a scene such as this one. Retire in Oregon...we would have done it in a heartbeat if we could stand the winters. We are still drawn back to the beauty of the state every year. Check out RVing and Park models as a way to enjoy this exceptional state in a frugal living manner.